A) What is Agendrix Messenger? Agendrix Messenger a chat module allows you to automatically connect the members of your organization without having to rely on your personal networks. This ensures more effective and professional communications on a daily basis. The Messenger Function must be enabled by your employer before you can use it. B) How does Agendrix Messenger work? 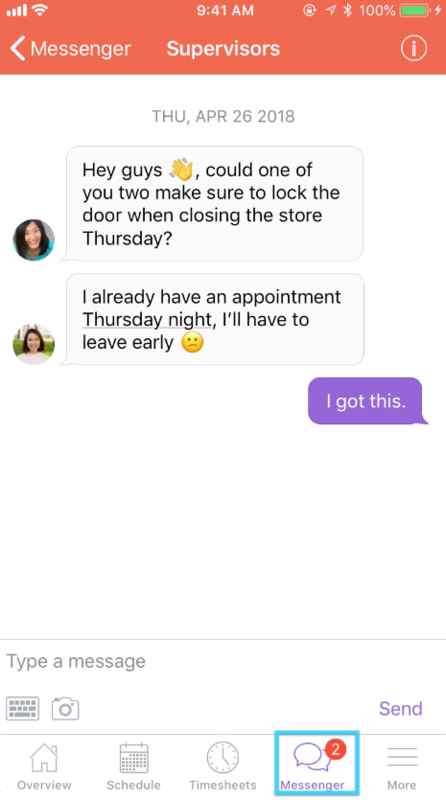 To start a new conversation, simply click the purple "+" button (see blue arrow). To disable notifications, leave a conversation, or rename a group conversation, click the purple "i" button (see pink arrow). This will display these options (see pink box). Agendrix Messenger is also available from the Agendrix mobile apps for employees section on iOS and Android.